The news cracked the girls’ sobriety and replaced it with a rich excitement that leapt between them like St Elmo’s Fire. The gentleman to her right glanced from the corner of his newspaper, then returned to whatever he was doing. Her friend spoke up. The first girl blushed, clearly pleased with this praise. It was remarkable how this morning the same words would have felt hollow to her but now, after her interview offer, made perfect sense: here were the irrefutable consequences of her hard work, something to be shown to friends, enemies and herself as proof that someone important felt she had what it took to become famous. This person’s career depended on finding the next big name, and he had chosen to consider her. Above all else she had achieved something here, even if she wasn’t entirely sure what it was. The girls’ attention was briefly stolen by a scruffy looking man sitting on the chairs opposite. He glanced up and down the corridor with the same furtive gestures as a rabbit watching for wolves, peeking from between his dirty, tartan baseball cap and thick, green raincoat. This in itself marked him as suspect, as the weather was balmy, a typical late afternoon in July, and all other passengers wore no more than one thin layer of clothing. Suddenly he stood and walked in determined strides towards an exit, trailed moments later by a security guard. Then he was out of sight, to a different part of the train. The two girls looked at each knowingly, they had both tried to ride the train without a ticket before, smiled, then stood themselves as their stop approached. The train came to a halt and the two girls disembarked, illuminated by the golden light of a summer day’s close as they disappeared down the platform. The gentleman opposite placed his paper on the small table to my left, took out his mobile and himself prepared to leave. As he rose from his seat and turned in the opposite direction of the girls, he began to speak. As his voice faded into the muted tones of the commuting crowd I noticed the paper Frank had been reading. 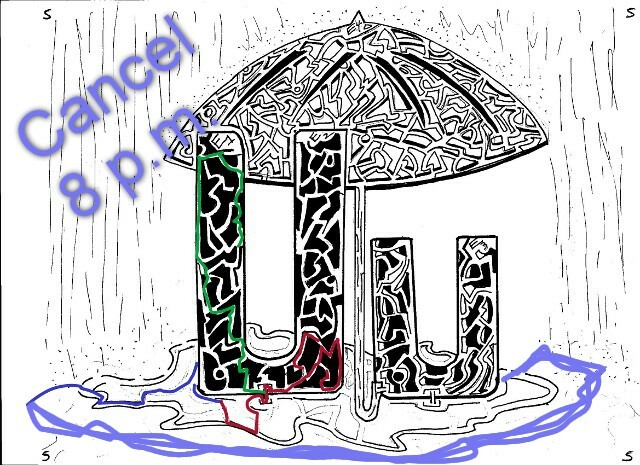 An elaborate puzzle was visible, a maze, formed beautifully into the shape of two letter “u”s hiding underneath an umbrella during a rainstorm. Several different inks were present, the remnants of previous challengers that had built upon each others success, with the final solution provided by Frank himself. I pondered his answer briefly, then flipped the paper over and turned to the job vacancies.